NOTL Realty | Niagara on the Lake Realty | Art and Ribs! Home » Niagara Homes – Art and Ribs! Niagara Homes – Art and Ribs! So, the time has come and the annual Art by the Lighthouse show at the Niagara Pump house is on! I mentioned this last week and my wife, who is one of the organizers, advised me I was helping out again this year. The show usually takes place in the grounds of the Pump house and around 30 artists erect display tents in the grounds for all to come and see. This year, however, was slightly different. In addition, there were numerous local art galleries on the tour who opened their doors. A tour brochure with maps outlined the full extent of the event that was on for the full weekend so you could break down your visits to several each day. The show was a great success for the artists and also raised a good chunk of money to help fund the Pump house ( a registered charity). During this weekend, there were a number of other events on in the area I would have liked to have gone too but time just did not allow. Canal Days at Port Colborne was one such event! I missed it last year too (for the same reason!) but will definitely make it next year. 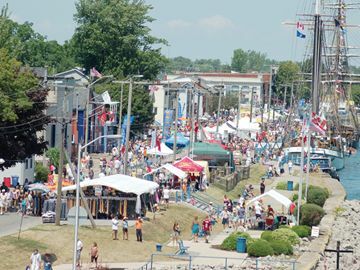 Thousands of people descend upon Port Colborne, a small canal-side community about half an hour away, to see the tall ships, listen to live music, have a few beers and a barbecue, and generally have a bit of a party! 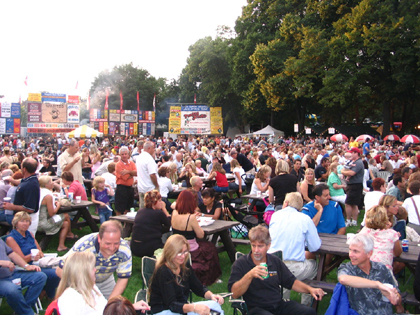 Although I missed ‘Canal Days’, nothing was going to stop me from getting to the St. Catharines Ribfest at Montabello Park! This event, organized by the local Rotary, was on for three days and I am very pleased to report we made it to this on Saturday evening! Always very well attended, at least a dozen ‘ribbers’ showed off their grilling and sauce making skills. It is pretty hard to beat the combination of ribs, corn, fries, blooming onion, beer and live music on a Saturday night – though my waistline might disagree! The only downside this year, was the fact it poured with rain for about half an hour. Luckily, my wife and I had our food and were sat under the big tent, eating but others were not so lucky! If you have lined up for 30 minutes, waiting to order, you can’t let a drop of rain stop you! Sunday, was a beautiful day and having helped out down at the Pumphouse again for a few hours, I went off to hold an Open House with NOTL Realty just up the road from 2-4pm. The town was crammed with visitors so there were lots of people dropping in. After I had finished, it was back to the Pumphouse, help clear up after the show finished at 5pm then back home for a well deserved glass of wine and another barbecue. You too could enjoy weekends like these if you are considering moving to the NOTL area. Just get in touch with me, Kevin Stokes, at Niagara Homes and I will help you make it happen. 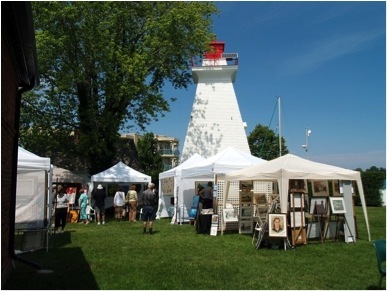 This entry was posted in Blog, Uncategorized and tagged art by the lighthouse, canal days, niagara on the lake events, Niagara on the Lake Realty, niagara pump house, st. catherines ribfest on August 6, 2013 by wp_admin.